The dreaded dropped smartphone. Sure, some are made of sterner stuff or you might get that indestructible case that protects against shock and has enough bevel that the screen doesn’t eat floor, but sometimes you just need extra. With that said, sometimes “extra” means going to a design and engineering extreme. 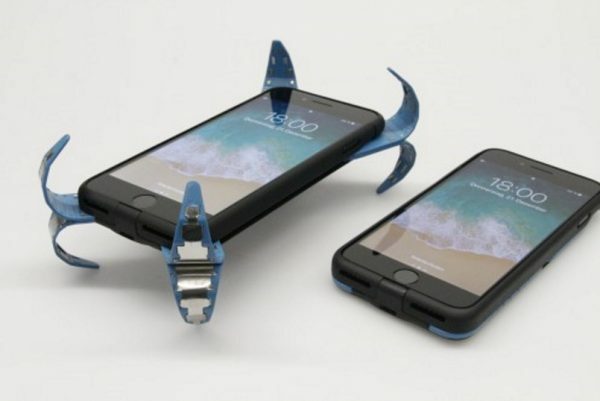 Enter engineering student Philip Frenzel of Germany and what is being called the “mobile airbag.” The protective smartphone gear was discovered by DesignBoom and features metal prongs that will save your phone from gravity-induced death by deploying in mid-air. While it looks cumbersome–and dangerous at first glance–young Frenzel scored an award for his mobile airbag by the German Mechatronics Society. That was enough for him and engineering partner Peter Mayer to move forward with getting it on Kickstarter next month. We’ll have to see if it piques the interest of your everyday smartphone owner.